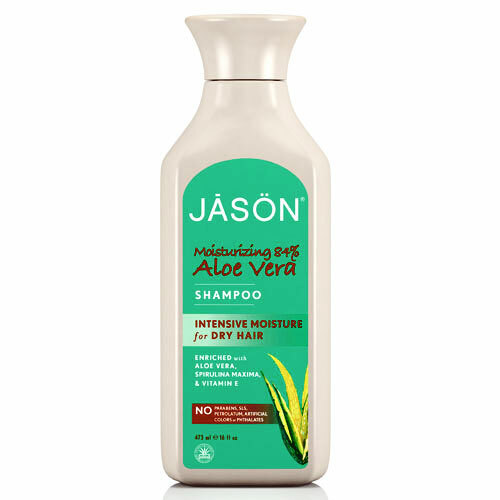 Jason`s pure, natural moisturising Aloe Vera Shampoo gently cleanses and replenishes needed hydration to dry hair that’s prone to static and breakage. Natural aloe vera and spirulina maxima extracts deeply nourish and restore hair’s natural moisture balance while equisetum arvense leaf extract and vitamin E add healthy luster. Renewed with silky moisture, your hair shines with soft manageability. Safe for colour-treated hair. Aloe Barbadensis Leaf Juice*, Cocamidopropyl Betaine, Glycerin, Sodium Lauryl Sulfoacetate, Sodium Chloride, Calendula Officinalis Flower Extract*, Chamomilla Recutita (Matricaria) Flower Extract*, Citrus Grandis (Grapefruit) Fruit Extract*, Equisetum Arvense Leaf Extract*, Lavandula Angustifolia (Lavender) Flower/Leaf/Stem Extract*, Spirulina Maxima Extract*, Panthenol, Tocopheryl Acetate, Citric Acid, Guar Hydroxypropyltrimonium Chloride, Sodium PCA, Sodium Suflate, Alcohol*, Benzoic Acid, Benzyl Alcohol, Dehydroacetic Acid, Phenoxyethanol, Potassium Sorbate, Sodium Benzoate, Benzyl Benzoate, Hexyl Cinnamal, Fragrance (Parfum). *Certified Organic Ingredient. Gently massage shampoo into wet hair and scalp. Rinse and repeat if desired. 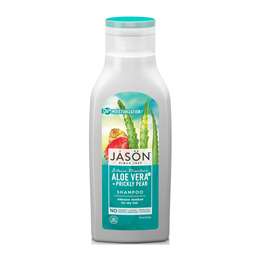 Follow with Jason Moisturising 84% Aloe Vera Conditioner. Below are reviews of Jason Moisturising 84% Aloe Vera Shampoo - 473ml by bodykind customers. If you have tried this product we'd love to hear what you think so please leave a review.